Stratocumulus undulatus is a classification of stratuscumulus clouds. These forms of clouds are mainly noticeable around the end of the year, during the fall, or autumn and wintertime. As the weather changes so do cloud formations. Depending on the amount of moisture in the air and the temperatures, you can expect to find different types of clouds. What height are stratocumulus undulatus clouds found? Stratocumulus undulatus are a cloud base that forms at a low level, clearly visible. They are a kind of amalgam of stratus and cumulus clouds and generally there is clear sky above them. They can form anywhere between the earth and up to around 2000 meters, although it is not unusual to see them slightly higher in the atmosphere. 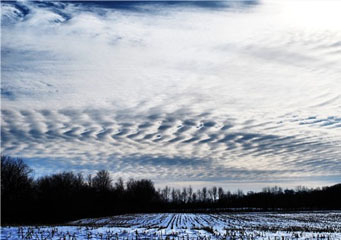 Stratocumulus undulatus comes under the category of stratocumulus clouds of which there are a number of different types. They are formed from stratus clouds and cumulus clouds that are affected by air motion to produce an undulated effected cloud. How are stratocumulus undulatus clouds formed? Stratocumulus undulatus clouds rely on different wind speeds or air currents to create their formation. Clouds are formed when warm air meets cold air. If you have wind speed combined into the mix then this will have an effect on the type and style of cloud formation. When you have a wind or air current above the cloud formation combined with a different wind speed below the cloud formation then this rubbing together effect will produce elongated clouds that give a kind of ripple effect. What do stratocumulus undulatus clouds look like? Stratocumulus undulatus have a long wavy look that goes across the sky in ribbons, something like you see on the sand when the tide has gone out. Of course they are not sandy brown in color; they are generally gray or white. How common are stratocumulus undulatus clouds? Stratocumulus undulatus are very recognizable as low level clouds and particularly if you are aware that their appearance tends to be towards the end of the year. Where can I see stratocumulus undulatus clouds? You can often see stratocumulus undulatus clouds at the end of the day as the weather starts to settle down. As previously advised, they can also be seen more readily during the fall or winter. They can be found worldwide, as with many clouds. They are associated with drizzle or light rain and may be a precursor to a storm or bad weather. They may also just be a slight shower of drizzle in their own right.